Just Because Lilies Out of the blue, for no reason at all or simply 'just because', sending flowers when they're unexpected works wonders and makes a person feel exceptionally special. Experience first hand our commitment to excellence and customer service and choose flowers from FlowerFresh. Our range of lilies is extensive, whether you like asaitic lilies, a lily bouquet or a calla lilies bouquet, each and every arrangement looks unique is designed with the utmost care and attention to detail. 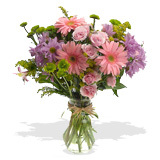 A particular favorite of FlowerFresh is an arrangement of white and pink lilies.